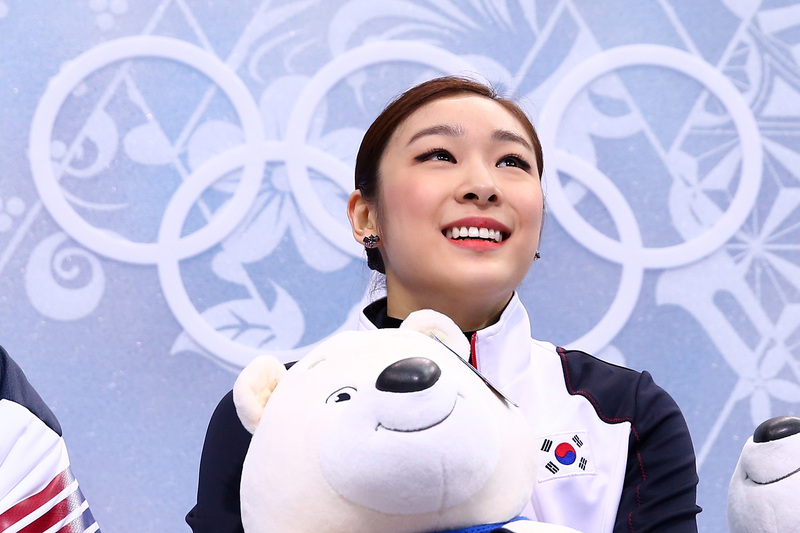 Can you believe that Kim Yuna is turning 24 this year? I have a really hard time wrapping my mind around the concept of rising to the top of your respective field and (alas) retiring by that age. I mean, check back with me in a year, but I don't think I'll be the next Tina Fey by then (though apparently Nora Ephron started her career as a mailroom girl, which makes me feel a little better). Well, whether she makes a (very) unexpected return to skating or not, she's always been one of the very best dressed in the business — she's rocked everything from 19th century waif-inspired for her Les Miserables medley to ultra-sparkly Bond Girl chic for her James Bond medley over the course of her career: and as such, I think it makes sense to pay homage to the birthday girl with a fashion retrospective. So let's start our countdown at number 10! You'd think long sleeves and velvet would be a bridge too far, but Yuna manages to make the look fabulous. She is working that crimson (and gold bric-a-brac!). Somehow, simultaneously subtle and high impact; just like its wearer. Sometimes, simple is best. Plus, the ombré on the skirt (and the criss-cross rhinestoned detailing on the open back) are just plain lovely. Perfectly on theme with her program and song... and again, just the epitome of classy charm (there's a reason people call her "Queen Yuna"). Quite possibly the best use of finger guns, ever. I'm kind of obsessed with this costume: The sleeves are so awesome! The bodice is so prettily detailed! The skirt is so fluttery! Who knew garnet and ice blue looked so amazing together? The crystals on this costume are off the charts. Some people took umbrage at the bright chartreuse shade, but she's pulling it off wonderfully. As usual, the crystals on the bodice are to die for, and the delicately fluttery skirt and ever-so-slightly belled long sleeves finish the look admirably.